In early January, Saudi punished workers for "destroying public property and inciting unrest" while protesting unpaid wages. Meanwhile, the government has not meaningfully penalized the companies that failed to pay workers for months. In early January, 49 former BinLadin Group workers were sentenced to 300 lashes and up to four months in prison. They were punished for protesting months of unpaid wages and setting the company’s buses on fire. The Kingdom has found the resources to charge these still unpaid workers but has still failed to meaningfully penalize the BinLadin group and other large firms that violated contracts with thousands of workers in 2016, as well as local labour laws. Meanwhile, the Bin Laden group could still file a lawsuit against the workers for damaging company property - though it would be quite a feat if funds for litigation somehow appeared while the company is still unable to secure funds to pay workers past due wages. Prior to the international spotlight on the thousands of migrants stranded and unpaid for months, Saudi advised workers to leave the country – without compensation. Returning home without due wages is the fate of many unpaid or underpaid migrant workers. The much heralded Wage Protection System (WPS), which has been gradually implemented since 2013, has evidently not succeeded in either preventing or redressing wage abuses. The system should flag missed monthly payments as they occur, after which authorities are meant to investigate and impose the necessary penalties. But as Migrant-Rights.org previously cautioned, the WPS provides few protections to migrant workers without enforcement, and without a legal system that is responsive to migrant workers' rights. The system's "protection" is only theoretical as migrant workers still face a number of obstacles to redressing wage and other employment violations, including high costs, unsympathetic authorities, and an excruciatingly inefficient judicial process. The Saudi Justice Ministry announced that new labour courts would be established by the end of 2016 to help speed up these cases, but no updates have since been forthcoming. 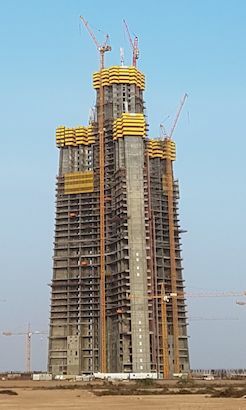 Completion of the Jeddah Tower has been delayed due to the BinLadin Group's financial problems. “My husband works for Bin Ladin and he has not been paid for seven months now. This is the eighth month without pay. We have been told through news articles in Saudi gazette and Arab news that the king has given a specific amount to monetary regulation agency to clear all pending dues and Bin Ladin was supposed to carry out necessary steps in December 2016 to make sure all dues are paid. Unfortunately, there is no update or any intimation of any sort from the authorities or the bosses.We are just left stranded and helpless.There is no one to turn to and no one feels the obligation to at least give us an update about the situation that we have been pushed into and how it will be resolved....The managers have transferred all their assets to other GCC countries and threaten to fire any employee who asks for his dues. Hundreds of other families whose primary breadwinners have worked for decades in the company are facing the same issue. Among those awaiting compensation are both hard labourers and white-collar workers. Most are stranded in the country, as it is extremely difficult to leave without their owed salaries. Those that do return home are unlikely to be able to continue fighting for their wages once they leave. The sentencing of these workers reflects the Kingdom’s attitudes towards migrant workers - including that buses are more valuable than migrant workers. But more deeply, the unfair sentencing demonstrates the state’s fear of migrant workers as a politically destabilizing force. These fears drive disproportionate responses to migrant crimes, restrictions on migrant residency and social rights, and the xenophobic narrative of migrants in state media. It is why workers protesting unpaid wages were deported from the UAE in 2015, and why an Indian worker was recently killed during a similar protest in Bahrain. Protesting migrants pose a particularly visible challenge authority as strikes and demonstrations are illegal throughout the Gulf. Yet, Gulf governments could easily avoid these disruptions, and the embarrassing international headlines, even if all they did was enforce laws the already have legislated. Saudi and other Gulf countries are threatening their own economies and by extension their regimes, by politicizing the most basic human rights. Workers’ rights to fair compensation for their labour are encoded in the country’s own legal system, yet migrants are punished, even killed, for attempting to obtain these rights in the only way that captures authorities' attention.